Resembling a giant surfboard, the 18' long concrete island is jet black and feels right at home amongst the home's glass and steel. A wooden bracing system and Lexan sheets were used to create an inverted form for the island. After the forms were removed light steel wool was used to remove a layer of calcification. Stone Soup Concrete in Florence, MA designs and installs a one-of-a-kind kitchen island made of concrete. Maybe it's not surrounded by water and there aren't any palm trees, but the kitchen island created by Stone Soup Concrete is a place you would love to visit. As the central point of attention in a very unusual house (with one bedroom, 13 bathrooms, and not a straight line in sight) this black concrete island was a challenge to build and place. "We were happy to be involved with this home," said Stone Soup Concrete owner Michael Karmody. "Most of the contractors on this project were well matched if not overmatched by the challenges of the work." Resembling a ship, or perhaps a giant concrete surfboard, the 18' long island is jet black and feels right at home amidst the home's glass and steel. "To understand the shape," says Karmody, "you have to imagine an oval elliptical cone and you top it and flatten it then push it forward so you have a void where you can put cabinets. You cut that in half going up and down vertically then take the remaining section and cut it horizontally and flip it over. So then the flat section stays flat and the prow area gets larger as it comes up and the stern area gets smaller. At the base it is an ellipse but at the top it no longer is an ellipse and has a twisting section that goes between the two. So it's going from out to in and the in part is what will eventually form the seating area." Whether you get that or not really isn't important, because one doesn't have to completely understand the shape to appreciate it. But going from the architect's vision of a shape to concrete is another story. 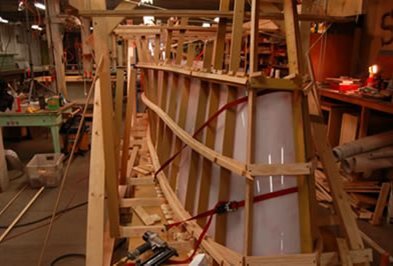 Karmody created a wooden bracing system to serve as control points for the shape and then positioned Lexan sheets inside that were able to bridge between the braces. Lexan is the material used to make Nalgene bottles and is often described as "bulletproof." 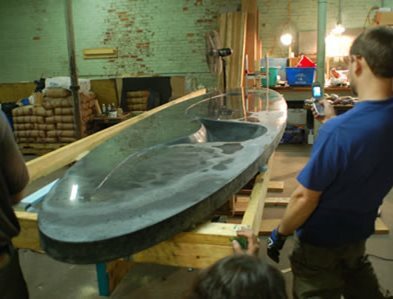 "We used Lexan," says Karmody, "because it will bend without breaking and thus held the shape and the flow of the 26-foot-long serpentine stanchion pathway. We also chose Lexan because it would confer a smooth texture to the concrete surface." In cross section, the island base is only 2 or 3 inches thick. For the interior form, Stone Soup workers used Styrofoam that was also supported by wooden cribbing. The concrete mix Karmody used was not a self-consolidating concrete, but rather a "pretty standard low-slump, fairly stiff mix." The black color was integrally mixed into the concrete and concrete was placed in 4 discrete pours, although placement was never stopped so that the entire base is a monopour. Consolidation was accomplished with rodding and with some mechanical vibration. Reinforcement, positioned as the concrete was being placed, was wire mesh and fiberglass. "The reinforcement provided a tension body throughout the piece," Karmody says. 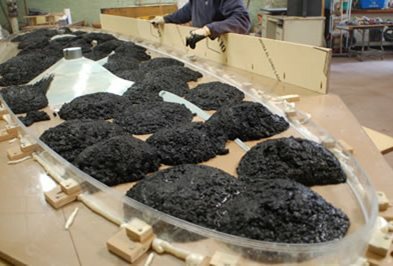 The countertop was cast upside down using an edge form and the sink voids were roughed out with an extruded polystyrene foam and finished with a marine-grade epoxy shell. 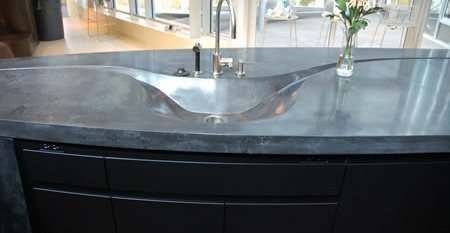 To get concrete around the sink basin insets, "we used a top hat, a sort of pressure cowl that we put over the form and load concrete into," says Karmody. "When vibrated the concrete relaxes and wants to push out the hat material. Once the concrete has stiffened we remove the form and trowel for smoothness. This area is never seen so it doesn't have to be perfect." When the forms were removed there was a light calcification on the surface that was easily removed with light steel wool. "We rely on getting the surface as perfect as possible coming out of the form," says Karmody. "Most of our pieces we don't grind or polish. With this method you see a shadowing of the aggregates that produces a live patina, a snapshot if you will, that has much more depth than if you were to grind it." Then came the job of moving the whole thing into the house. "We started with the understanding that it would not leave the skid it was built on until it was installed. So when I was setting up the form I had to know how wide the door was and how we could get through the door. 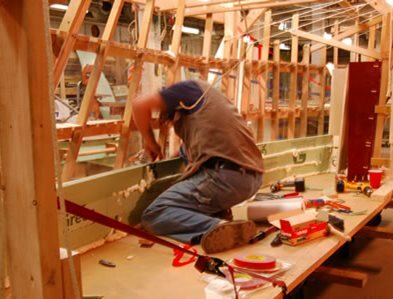 There were no easily removable doorways or windows and we wanted to land in the spot where it would be easiest to roll into position." For the move, they hired a tow truck, which backed up to the house and rolled the base down a ramp and into the house. Once in position, Karmody and crew built staging, picked it up at five points, rolled the skid out, and dropped it onto the subfloor. Stone Soup uses V-Seal 101 (a potassium silicanate) as a densifier on the countertops and then applies a water-based breathable polymer (carbonate/conagen-based) sealer (Pro-Seal Ultra Shield II-A). "We are imperfectly pleased with it and it is really expensive, but it works fairly well," says Karmody. Cabinets installed in one side of the island were made from multiple laminated MDF material that Karmody says were formed to match the sweep of the arcs in the kitchen and finished with a sprayed-on lacquer that matched the counters. Stone Soup focuses on countertops and bath tubs. "I enjoy a project that brings a challenge and that requires us to develop new methods to handle the situation," says Karmody. "Right now in the shop I have a piece that is 16 feet 7 inches long by 4 feet wide with a sink and a railroad track set into the concrete for a butcher block that will have wheels. But the island was bigger and the geometry was challenging at every point." Karmody started out studying international relations and the Soviet Union, where a lot of concrete was used. He became fascinated with concrete and ended up with an art degree. He and partner Michael Paulsen started out building church steeples. "My partner's wife was with her newborn second child when she saw a photo of him on the cover of the local paper installing a church steeple without a harness or hard hat. She suggested that perhaps the crazy idea we had of building concrete countertops wasn't so crazy after all."